When traveling on the road I often get up wherever we are and take a walk in the early morning light. I usually take my camera with me. 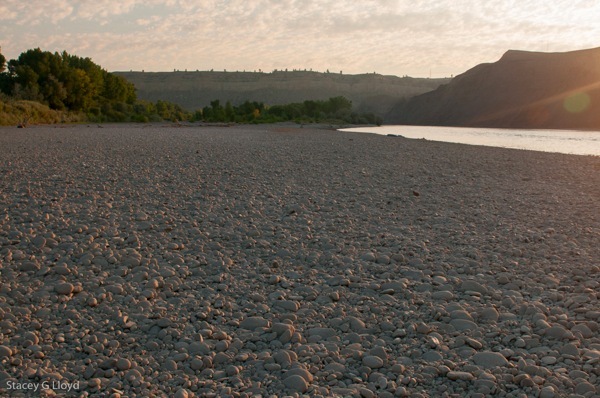 Today, we were camped along part of the Yellowstone river (but not in Yellowstone NP). As I anticipated the night before, the sun was rising behind us so most of the area was in shade. What I did see was a lot of river rock. 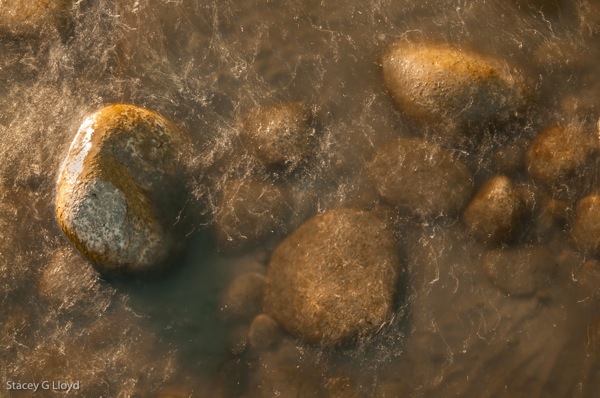 I decided to challenge myself and see what images I could create using this river rock. In some respects this can be like calisthenics for photographers . Here are some of the images I came up with. 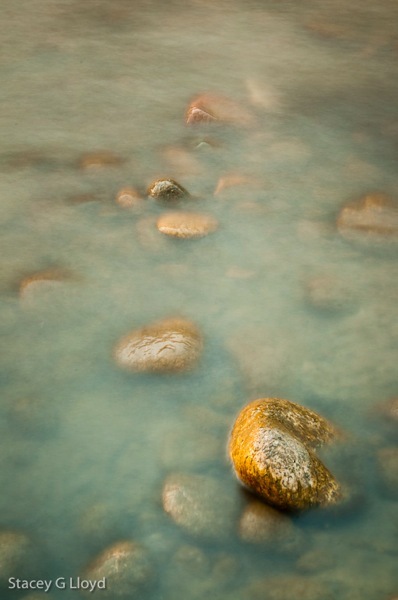 The opening blog image used a variable ND filter to take a 3 sec exposure of the waves off the river rippling over the rocks. I found that longer exposures smoothed the water out too much and you would loose the wonderful painterly texture. This next image is a straight shot looking for a nice composition amongst all the chaos. The grouping of three rocks attracted my attention. 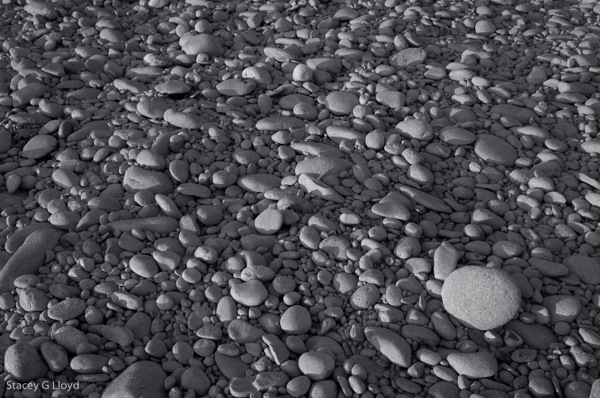 Here is this next image that I converted to B&W in Lightroom, a single larger rock stands out. I placed it tight in the corner to create a sense of loneliness even though it was surrounded by other rocks – a conceptual image. Below I applied a technique I usually save for flowers. This is an off axis 9 shot exposure while zooming and rotating the camera. 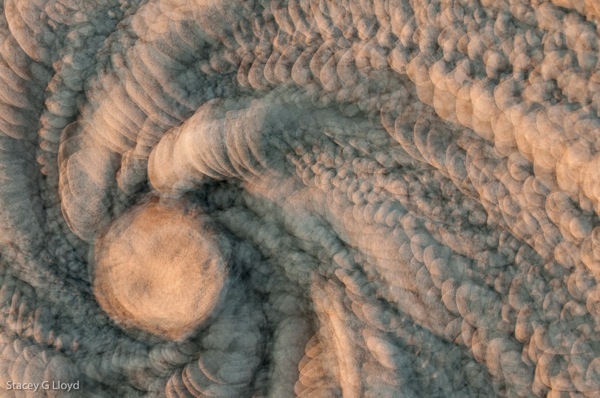 It does create an interesting image when applied to rocks. 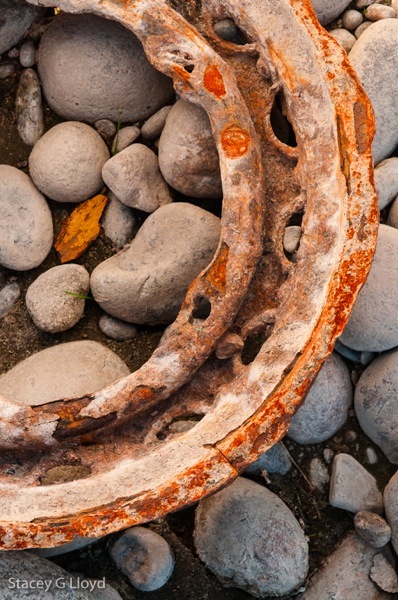 A rusty old wheel well provided this next abstract image. 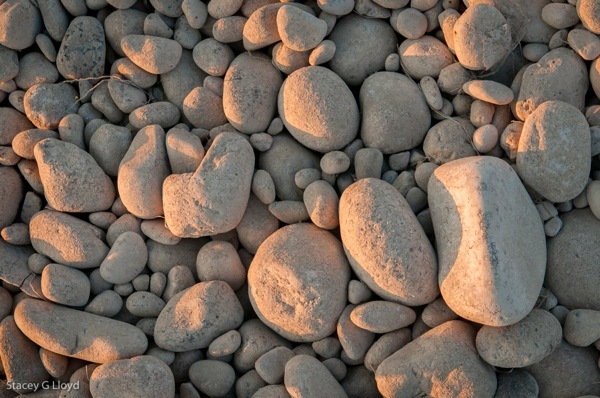 Using the variable ND I shot 15 sec exposures as the morning sunlight started hitting some of the rocks. The challenge here was to find pleasing compositions in the rocks. 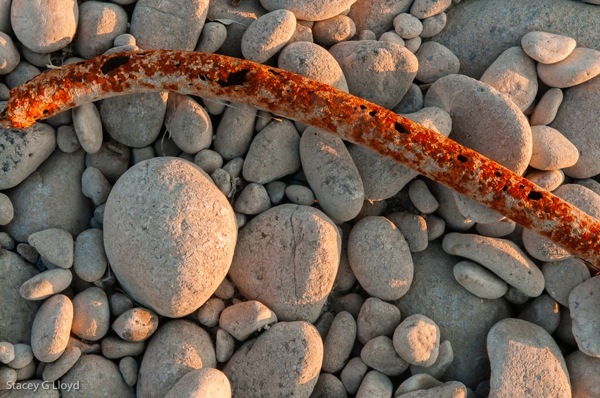 A piece of rusty metal place within the rocks creates yet another abstract image. Try challenging yourself. Start with a “non-photogenic” setting and see what you can create – use your imagination, try things you never have before. This entry was posted in Technique and tagged Montana, photography, rocks. Great challenge! Even though I have great views during my commute, I’m very limited in what I can photograph from the car, or side of the road, since I can’t venture onto private property. Like with your Rock challenge, it is a matter of working with available light , composition etc. Even a beautiful scene can be challenging to ‘see’ in new ways. Thanks for inspiring/challenging us !